I'm trying to make a power regulator for a 500W (30A, 15V) peltier module. Basic idea is to make 10kHz PWM with a 555 timer regulated from a knob POT, and drive a MOSFET with that. Problem is, i never done something like that before, and while it seems to work ok, there are several suspicious things with it. So, i'd like to know what of it is normal, and how to fix whatever of it that is not. 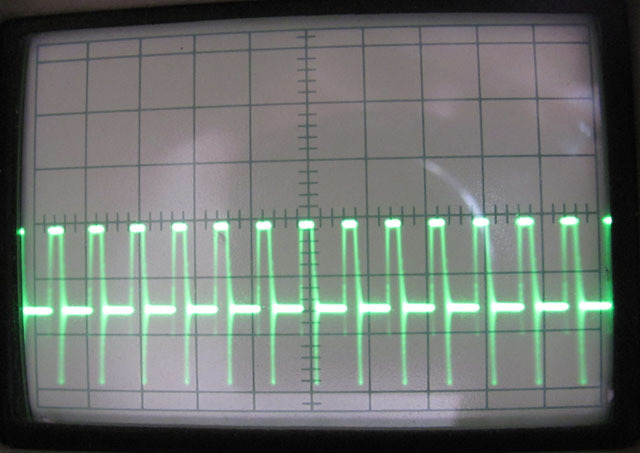 First - there are spikes at the end of duty cycle (measured at MOSFET drain). These were severely reduced by adding a capacitor across the power supply. Curiously, adding it at the PSU side does nothing, while putting it close to the MOSFET does all the difference. Starting from some capacitance there is no point to increase it any more. Also, no significant difference between a low-ESR capacitor and a regular electrolyte. What is this spike, and is it anything to worry about at all? 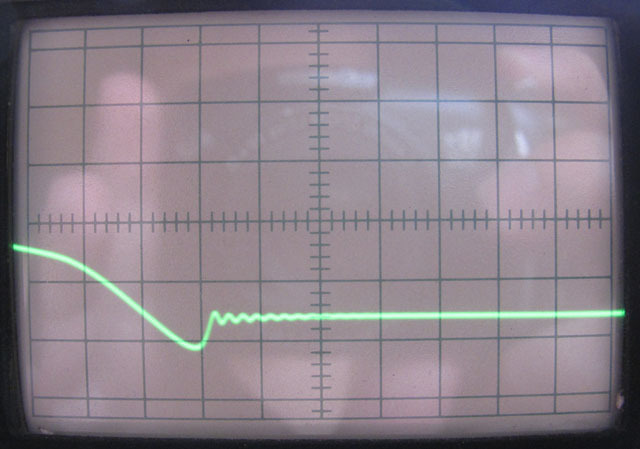 Second, the PWM generator alone produces a nice square wave. But with the MOSFET connected, there is a mess at the gate. Is it related to the spikes at the drain? Third, the MOSFET have an open resistance of 1.46mΩ. So, if i got this right, at full power it would produce only 30*30*0.00146 = 1.3W of heat. I'm not sure how to measure that, but with it running at 5% duty cycle a 5x6cm radiator is getting too hot to touch after a few minutes. Nothing a fan can't fix, but is that really how much 0.065W is? I suspect there is something not so trivial going on here - how can i calculate power dissipation of a MOSFET in continuous switching action? Is the heat dissipation related to the first and second? I suspect that the strange form at the gate might cause it to spend significant time with higher resistance, causing lots of extra heat, but no idea how to check this. The second and third problems are related. In order to turn on the mosfet you need to charge the gate capacitance, the faster you do it the faster the mosfet will turn on and the faster you discharge the gate the faster it will switch off. You want to remain in the area when the mosfet is partially turned on as low as possible, this doesn't happen in your case so you get heat on the mosfet. see page 17 for the different gate capacitance charge stages. 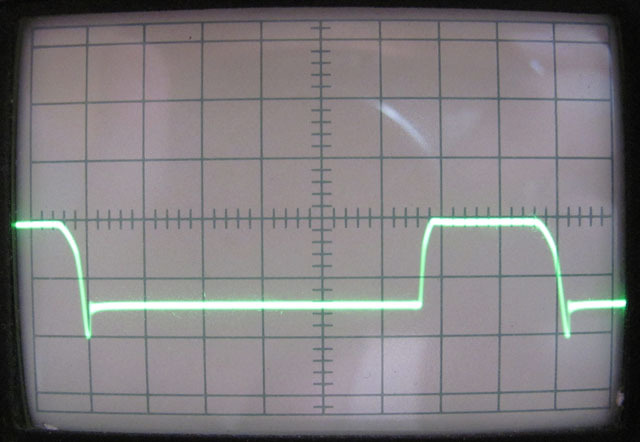 First Question -- The spike is likely due to the wire inductance between the power supply and the transistor. The inductance is small but can cause significant spikes at high current levels. As long as the peak voltage is below the transistor Absolute Maximum Vds rating you are OK. Often a small series RC snubber circuit is connected directly across the transistor drain-source terminals to minimize any spikes. For the dissipation problem, you can try reducing the 220 ohm gate resistor to 10 ohms or less to reduce the charge and discharge time of the large MOSFET gate capacitance (19.2nF). (And make sure there is a ≈0.1µF ceramic cap directly across the 555 power and ground pins.) See if that reduces the heat dissipated by the transistor to a reasonable level. If not, you will need to add a gate driver as alexan_e stated. I agree that the apparently large transistor power dissipation is mainly caused by switching losses, due to sloppy gate drive. I don't want to comment about switching spikes now, but point to another interesting problem. It's basically a bad idea to drive a peltier cooler with PWM. Simply because the cooling effect is generated by average current, but the peltier element's internal power dissipation by RMS current. The smaller the duty cycle, the larger the excess power dissipation. E.g. about fourfold at 25 % duty cycle. It's strongly recommended to upgrade the switcher to a buck converter by adding a storage inductor and a rectifier, at least if you're interested to utilize the available peltier performance. Ah, that makes sense. I never actually bother to look up "MOSFET driver" despite hearing about them every now and then. Now, a quick fix of replacing the 220Ω resistor with a 10Ω one does seem to make a lot of a difference. About 2µs rise and fall time, 20000pF input capacitance on the MOSFET, thus 140mA of current needed, so 555 should manage. Are these the right figures? However, the ringing of the first problem is now much worse, reaching almost 50V. The MOSFET is rated at 75V, kind of close for comfort. Currently the wires from PSU are just two mostly straight pieces of copper, 40 cm or so, and moving them around does pretty much nothing. It's basically a bad idea to drive a peltier cooler with PWM. Simply because the cooling effect is generated by average current, but the peltier element's internal power dissipation by RMS current. The smaller the duty cycle, the larger the excess power dissipation. E.g. about fourfold at 25 % duty cycle. It's strongly recommended to upgrade the switcher to a buck converter by adding a storage inductor and a rectifier, at least if you're interested to utilize the available peltier performance. And they say that driving peltier with PWM is "one of the most electrically-efficient ways", provided that the voltage being PWMed is less than the Vmax of the module. Mine is rated for 15.6V and is driven at 15V. Where can i get more accurate info? I fear it's only true in terms of simple control circuit, but surely not in terms of effective peltier operation, e.g. achieving maximum Δt for a given amount of heat to be transported, or minimizing the power dissipated on the hot side for a given cooling power. It's possibly no problem if you have a pretty oversized heatsink and maximum Δt isn't an issue. But you should be able to derive áll relevant information from spefified peltier element characteristics and the thermal parameters of your system. 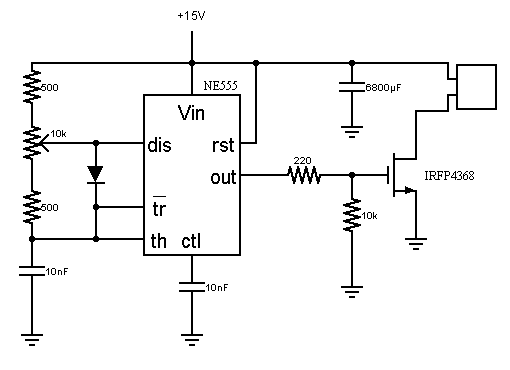 If you have a DC power supply of sufficient output current available, you can also evaluate it empirically and determine if constant DC current brings an advantage over PWM for your application. It's a natural result of increased switching speed with constant circuit inductance. It's not exactly clear how you measured this, because we would expect a positive Vds spike during switch-off. 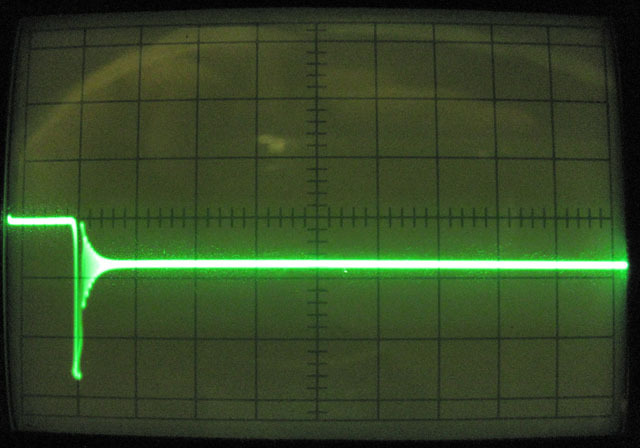 It looks like you inverted the voltage, or are measuring across the peltier element with a differential probe. External circuit inductance can be inactivated by placing a free wheeling diode near the MOSFET (provided there's a power supply bypass capacitor near the MOSFET, too). Last edited by FvM; 5th August 2012 at 20:13. It's not exactly clear how you measured this, because we would expect a positive Vds spike during switch-off. 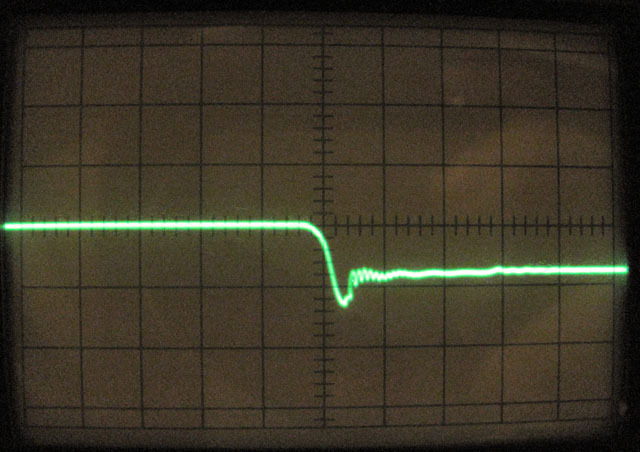 It looks like you inverted the voltage, or are measuring across the peltier element with a differential probe. It's measured at the drain, with ground at the - terminal of the power supply, which is where the source connects to. The moment depicted is switching off - it goes from being at zero when MOSFET conducts to being at 15V, when it stops. 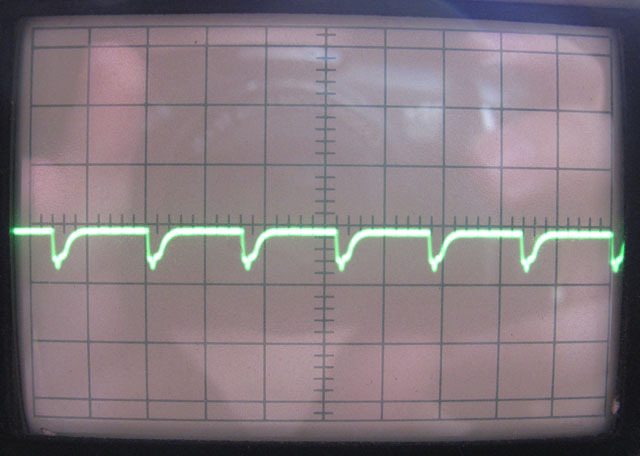 So, there is a positive spike to about 50V, and slow decay. I agree with FvM about the problem of using PWM with a peltier cooler. The power dissipation in the cooler due to I²R will increase for a given average current, which reduces its efficiency and cooling ability. The Tellurex note obviously was only considering the driver efficiency and not the peltier efficiency. You should add an inductor in series with the cooler to smooth the current. If the inductor is sufficiently large (a higher PWM frequency allows for a smaller inductor) you don't necessarily also need a filter capacitor since a small amount of ripple current should cause only a small increase in dissipation. Note that if you add an inductor you will also need to add a (flyback) diode between the transistor drain (anode) and the power side of the inductor (inductor between the power supply and cooler). This provides a path for the inductor current when the transistor switches off. A Schottky type diode will give slightly better efficiency than a standard diode. I don't understand your spike pictures either. 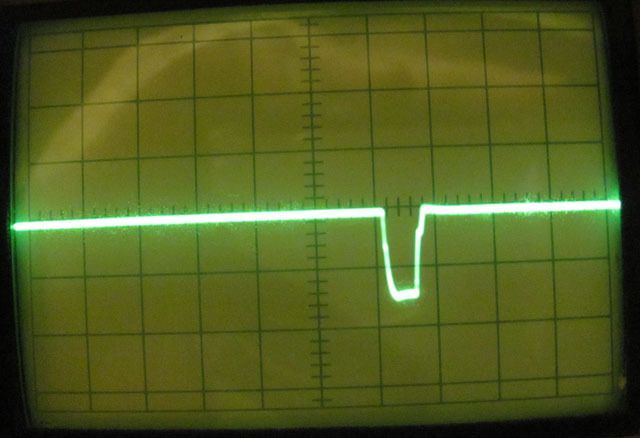 The spike should be a large positive voltage. I see a negative spike. Placing the oscilloscope ground terminal at the power supply could be part of the problem as you may be seeing the effect to the ground inductance. Connect the probe ground directly to the transistor source terminal. You always want to make measurement connections as close to the desired measurement point as possible. Last edited by crutschow; 6th August 2012 at 08:45. I don't understand your spike pictures either. 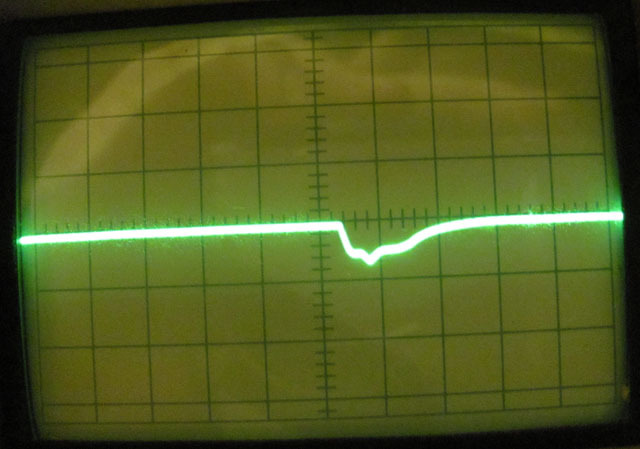 The spike should be a large positive voltage. I see a negative spike. 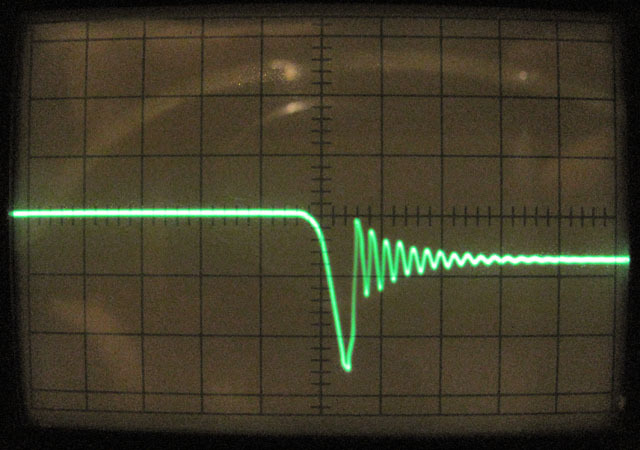 Positive voltage is downwards on that scope, i suppose that is not how it usually is? You should add an inductor in series with the cooler to smooth the current. If the inductor is sufficiently large (a higher PWM frequency allows for a smaller inductor) you don't necessarily also need a filter capacitor since a small amount of ripple current should cause only a small increase in dissipation. It's strongly recommended to upgrade the switcher to a buck converter by adding a storage inductor and a rectifier, at least if you're interested to utilize the available peltier performance. 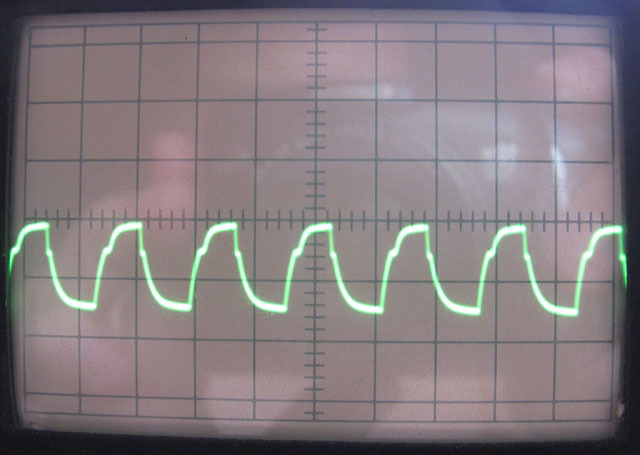 If i got this right, the RMS current of a PWM pulse train is A*sqrt(duty_cycle)? Then, for DC i get half the effective current at 25% duty cycle, 4.5 times less at 5%, or 4 and 20 times less waste heat respectively? Might be worth a try, if so. Now, what kind of things would be better? What are the things to look for here? Wildly estimating, if i only use an inductor, it should be the size of a big 30A choke - at 375µH it should give about 1A ripple current ( L=V*Δt/ΔI ) at the worst (50% duty cycle) case. With a capacitor i can use a smaller inductor, but the smaller it is, the larger are the currents through the capacitor. 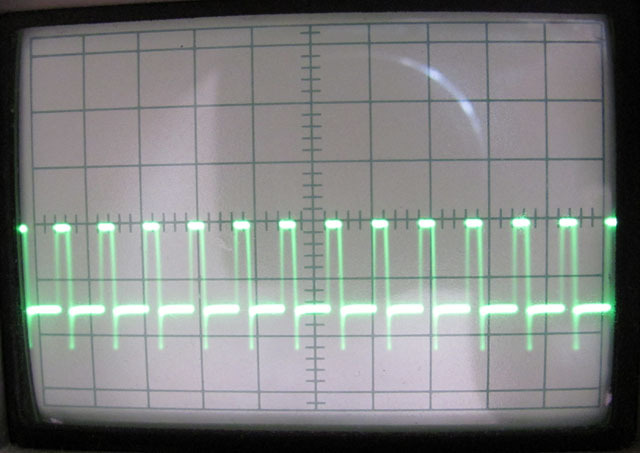 40µH and 500µF should give about the same ripple of 1A but with 1V of voltage ripple. Now, a choke for 30A range is easier to find than an 40µH inductor for the same range, but 40µH sounds like a few turns of thick wire on a small toroid. What side effects would there be? I've never seen a 'scope that has positive going down. Normally positive voltage is up. Is there a polarity switch on the input? There's a tradeoff between inductor and capacitor size so you pick a combination that gives you a reasonable size for both, for the ripple current you want. Why a 15A diode? Are you never going above 50% duty-cycle? If the cooler has a maximum current of 30A then you should use a 30A diode. Can't think of any particular negative side effects. Ok, it's spooky how a simple PWM controller turned into a mini-SMPS when done properly, but the extra complexity is totally worth it. I've added an inductor - 40 turns of thick wire around a 5cm torus. The result was clearly tangible - the peltier radiator stays cool at 5%-20% instead of growing quite warm, and at 50% it's still only warm instead of hot. The tone of 10kHz became much more audible, and the voltage at the module was still spiking a lot, so i increased the frequency to 30kHz. and added a gate driver. There is still some ripple at the module. With 555 driving the gate the switch took about 2µs and the transistor warmed up a bit, with the MAX4420 driver it's about 100ns per switch, and the transistor stays cold as metal all the time. Looks like it's way overkill when used properly. I thought it won't average to more than 15A - the current goes through it when the transistor is off, and increases with duty cycle, so it would only pull near 30A when running at 5% or so. It's most likely better to change the inductor position to the other side of the peltier element to ged rid of most of the switching noise at the peltier circuit. Otherwise EMC standard violations are foreseeable. Yes you could likely get by with a 15A diode but it will have a higher voltage drop (and lower efficiency) at the 30A peak current then a diode rated for 30A. But it's your call.